There is debate over the first to actually locate the islands and map them, off the coast of Argentina. The islands did appear on many maps that the Spanish used, as well as an admiral in the Turkish navy. However, it is highly likely that the English explorer, John Davis, commander of the Desire, actually set foot on the islands in 1592. 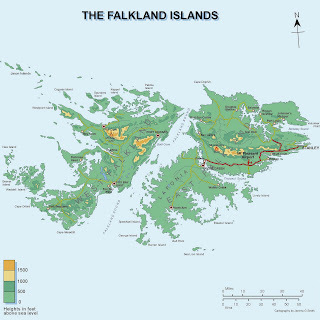 The islands took their name when Captain John Strong sailed between the two main islands and named it the Falkland Sound. After Anthony Cary, the 5th Viscount Falkland, who financed his expedition. In 1764, the French settled on one of the main islands, and the following year, a British settlement was established on the other of the main islands. Though neither side knew the other existed. The French colony was taken over by the Spanish in 1767, and placed under administration from Buenos Aires. Colonel David Hewitt, an American privateer flying under the Argentinian flag planted the Argentinian flag over the islands in 1820. By this time, the British and Spanish had both pulled their settlements out. However, both sides left plaques detailing their territorial claims. The Argentinians formed a settlement and penal colony in 1828. However, this settlement was never able to establish itself since it was destroyed by the US in 1831 when US warships shelled it in retaliation for the Argentinians taking US ships. In 1833, the Royal Navy returned to reassert British sovereignty over the islands. The British decreed that all inhabitants could stay, the only proviso being that they do not interfere with British governance. 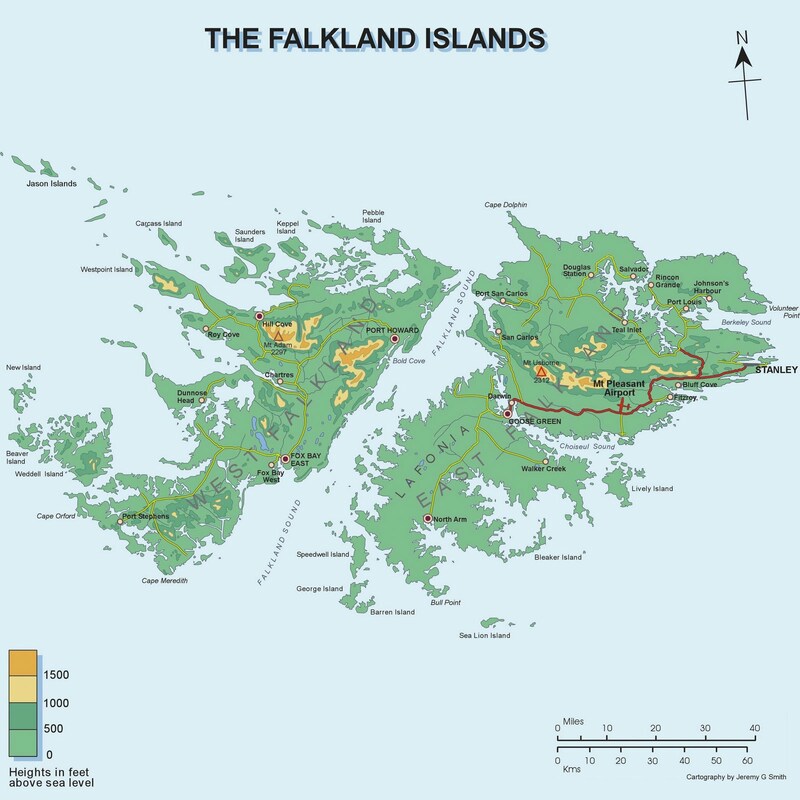 The Falklands grew in strategic importance for the Royal Navy, with the islands playing a vital role in fighting the German Navy in both World Wars. However, after the Second World War, the United Nations gave Argentina a public forum in which to reassert its sovereignty claims. Claims rejected by the British who said that any and all negotiations on the islands future will have to, at first, be agreed to by referendum by the inhabitants of the island. People who so far, show pretty solid backing for the islands remaining under British control. Relations with Argentina have been fraught since then. Sinking so far that in 1982, Argentina invaded the islands. Though this could be down to the Junta in Argentina trying to throw the public off the fact that the Argentinian economy was falling apart. The invasion led to a 2 month war with the British sending an expeditionary force which threw the Argentinians off the islands and reasserted British control. This war is notable for being the only time that a nuclear powered submarine has sunk another vessel at sea in a time of conflict. Relations between Argentina and the UK has improved, but never really become anything more than "workmanlike." Especially recently when the UK announced permission had been granted for deep sea oil drilling round the islands, with the Argentinians being deeply upset by this decision. However, 1 company has since announced that they have struck oil. It will, however, take further testing to see if the oil is commercially viable. The islands where awarded its coat of arms in 1948, and features a shield that is divided into 2. The lower half consists of blue and white wavy lines to represent the sea, and an image of the Desire, the ship of the explorer, John Davis, who gave the islands their name. The upper half of the shield consists of a blue background, with a sheep standing on tussock grass. 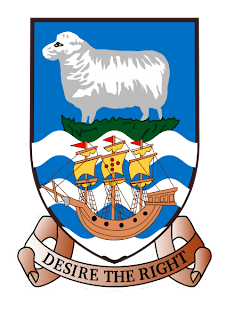 The sheep represents one of the islands main industries, wool, and the tussock grass is the most common form of vegetation on the islands. 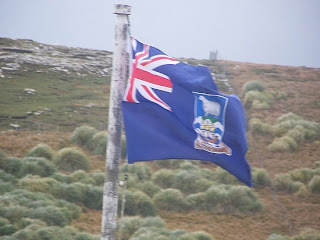 The Falklands also uses the standard British blue ensign with the coat of arms placed on the fly.